This unit is reminiscent of the Art Deco style and has a light coloured attractive finish. 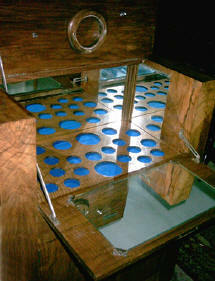 The top opens to reveal a very stylish serving space and a mirrored area for glasses. 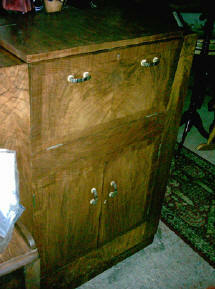 Underneath is a roomy 2 door cupboard some of the extras e.g. tray, lemon squeezer and cocktail sticks are missing but we are working on finding them. 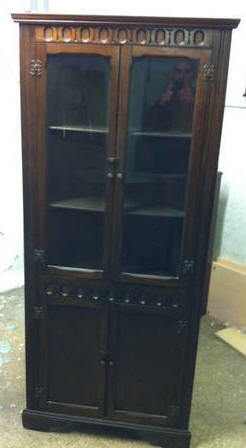 This attractive free standing oak corner unit has 2 display shelves behind the glass and one shelf in the cupboard area. Ht: 68" x W: 28" x D: 19"
At Pitmedden Furniture Workshop our stock is constantly changing and it is not possible to show all available items. The photographs are examples of stools which we have in stock or which we have recently sold.